I'm using "Chromium Version 70.0.3538.110 (Official Build) Built on Ubuntu , running on Ubuntu 18.04 (64-bit)"
Refreshing the page doesn't seem to work to fix it. 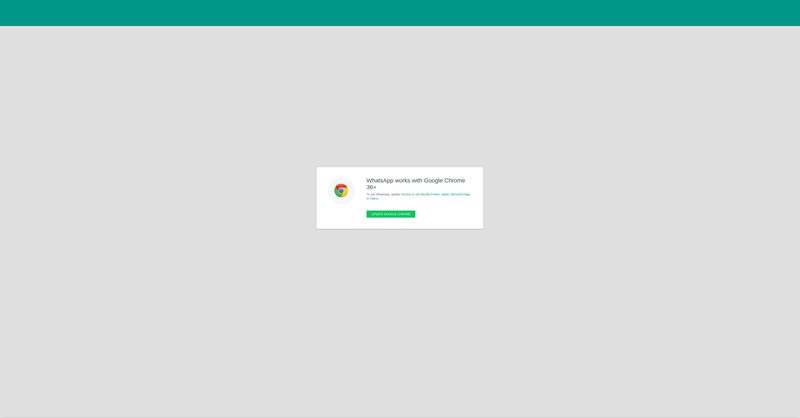 The linked duplicate did not help me, first, I expect Chromium 70 to be detected as Google Chrome 70, since it has all the required features, and I don't have any of the listed extensions installed from the second answer. Workaround: Change your user agent (e.g. explained here https://winaero.com/blog/change-user-agent-chrome/) to chrome and everything works fine. for many months, probably years the web-app was not only supported for chrome but also for it's step brother chromium. Technically they are interchangeable, both support the same features and standards. But since about a week ago the app stopped working on chromium. It doesn't seem to be a problem of a missing feature as spoofing the user agent allows me to still use the app. It's just kinda hacky and I'd prefer it to work native (again). Sorry for the inconvenience. We are aware of the issue and we are working on fixing it in a future update of WhatsApp. Unfortunately, we can't comment on any future release dates at this time.